The rugby family. It is an expression that you hear used, but what does it mean? 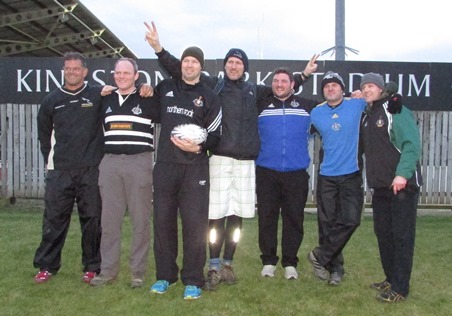 Well this week that became clear, as former Falcons players came from far and wide to make a fifty mile walk from Scotland to Kingston Park, carrying a haggis inside a rugby ball, to raise money and public awareness to support former Scotland and Falcons big man Doddie Weir as he faces up to Motor Neurone Disease. It all began many months ago when the leaves were still on the trees and we were looking forward to the Autumn Internationals. For me it started with a phone call from Stuart Grimes, like Doddie a former Scotland and Falcons legend. He was putting together a Burns Night in aid of Doddie’s Motor Neurone Disease charities, could the Supporters Club help? It was a question that didn’t need to be asked except out of politeness, of course we would help in any way possible. Some assistance with selling tickets would be a great help, keeping track of the people & the money, basically an administration job. It sounded like a lot of work, but all for a good cause, and something we could handle. Stuart outlined how he saw the event panning out, the work that would have to be done in planning and administration, and when that seemed sorted he mentioned one more thing. They were also thinking of walking from the Scottish border, in the middle of winter, to carry a haggis all the way from Scotland to Kingston Park, to present to Doddie on the night. I was still trying to get my head around what is involved in a mad plan such as this as Stuart ran through his ideas, and some of the former Falcons who would be making this walk, all now retired from playing professional rugby, and not necessarily particularly fit these days. Meanwhile I was trying to envisage the route they would have to take while down the phone came familiar names such as Pennine Way, Carter Bar, and maybe Wallington as the overnight stop. Carter Bar to Wallington in one day via the Pennine Way, I hoped they were still reasonably fit. When I mentioned that I live on a windy hill near Wallington & know the roads & hills of North Northumberland like the inside of my fridge, I found myself appointed as route planner, and volunteered to take the two days off work and be a support driver too. And so began something of an epic tale that was a privilege to be a small part of. 5am on the Wednesday morning and it sounded like somebody was throwing gravel at the bathroom window as I got myself ready. If it was this awful at 650ft above sea level, Carter Bar would be very much worse. Short of deep snow, this was about as bad as conditions could get for the hike. Setting off for the 6.30 meet at KP, the rain was like horizontal diamond bullets in the headlights. The duck pond at the bottom of the drive had become a lake, a sign of things to come. I found the troops sheltering outside the Club Shop under cover, the conditions at KP blustery and wet, but pretty tame. There were some mutterings about what it might be like at Carter Bar then we piled into the vehicles and set off. I made a detour via Wallington where Peter Massey would be leaving his car for use later. 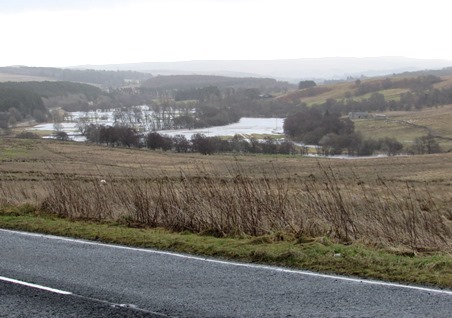 As we made our way up through Otterburn, day was taking over from night and we could see the flooding in the valley below. It looked pretty bad. 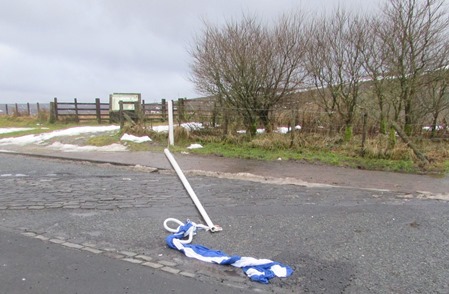 We were running late so were hoofing it a bit along the A68, and as we pulled into the northbound side of the car park at Carter Bar, I heaved the anchors on just in time to avoid crashing into the flagpole that had been snapped off in the wind. Whoever invented the term ‘filthy weather’ deserves some sort of recognition, as it describes perfectly the sheer scale of cold and of wet, and the full power of the wind that drove the rain into every part of your clothing. We joined the rest of the gang on the other side, people struggling to put coats on in the screaming wind, and camera crews trying to interview some of the players as they prepared for the walk ahead. I doubt that they got any useful footage from that. A hot and delicious pie was thrust into my hand, just the job as breakfast had been three hours ago. The haggis, brought over from Jedburgh by Gary Armstrong, was placed inside a Falcons rugby ball which had been brilliantly modified to receive the haggis, then to be laced up for the journey to Newcastle. With no ceremony whatsoever they were off down the road, glad to have the wind and rain at their backs. The next six miles were all on the A68, the nearest thing we have to a busy road in these parts, so it was heads down and maximum pace to get off the road as quickly as possible. Car and lorry drivers who were briefly held up by a bunch of hikers in their precious road were polite and considerate, most giving a friendly wave as they passed, and concerns about the dangers of angry motorists proved unnecessary. 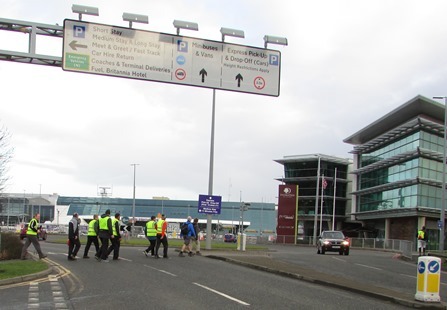 The boys did well and arrived at Byrness ten minutes ahead of schedule despite having been set a faster pace for this stretch. I had motored ahead while they were on less dangerous parts of the road and had found the next stage of the trek under water. Only the top of the bridge that they had to use was visible, and the path lost somewhere under a quarter mile wide stretch of water that filled the bottom of the valley. 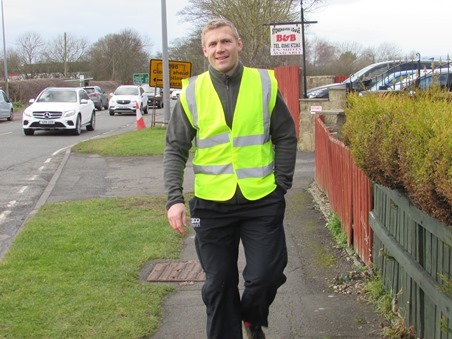 That meant another stretch on the A68, so after a brief stop for hot coffee and a change of shoes for Micky Ward, they were off again. It didn’t take long to reach the turn off to Kielder Drive, where the Pennine Way would take them up into the Kielder Forest, then onto the moors, hopefully to meet us on a small road in about two hours. I quickly checked the OS map with Grimesy, and with no confidence whatsoever that they would find their way across the wilderness, I watched them disappear into the unknown. I left them to it & motored over to Pegswood to pick up the menus for the following night. A special mention here for Azure Printers. The final design for the menu/order of service couldn’t be finalised until Monday, and the plan was for me to print them at work on Tuesday, but the big office laser printer didn’t like the huge area of tartan, choked itself with red and black toner, and broke down completely. We contacted Azure, explained the situation, and they were brilliant. They had them printed and folded, ready to pick up the following morning, and because it was for charity they charged almost nothing for this outstanding service. I had to call at Wallington as Pete Massey had left his thicker coat in the car, then horsed it back to the meeting point where they would hopefully emerge from the wild and wet hills. To be honest I was dreading the prospect of returning to find that they were lost somewhere on the moors with no phone signal & Micky wearing shorts. The very thought of plugging across the forestry tracks & climbing hills to find them haunted me all the way, so I was mightily grateful to find Doug (Grimesy’s dad and driver of the other support vehicle, also known as the mobile kitchen) at the end of the road onto the moors, with news that they had made it ahead of time and had eaten pies, now just half hour away. I was able to stop and eat two more of the wonderful pies that Doug had brought down with him all the way from Stonehaven near Aberdeen, and a thing called a rowie. A rowie is the Aberdeen equivalent of the croissant, basically as much fat in the form of butter and lard as you can possibly mix into flour for it to remain solid when cooked. It is the baddest of bad foods, but originally invented as a high energy food for fishermen to take to sea in the days of sail and oars, and just what these big lads needed as they powered through the hills, in weather that was thankfully becoming brighter. The wind had dropped and the rain gone as they headed into Otterburn. 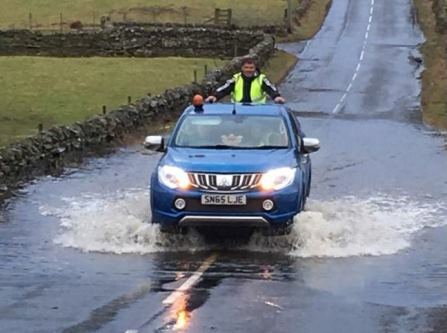 On my way back from Wallington I had checked out the flooded part of the road that they would be taking into Otterburn. Two hours earlier it would have been possible for them to climb onto the side steps of the truck and get carried across the water. Now it was deeper and they would get very wet feet, so with four big rugby lads, made even bigger by thick coats, squeezed into the truck, and Marius Hurter riding on the back step like Ben Hur on his chariot, they were ferried across to the other side of the water. Grimesy, determined that the haggis would get to KP without mechanical help, took to the fields and found a way around the flooded road. At Otterburn, Dave Walder had to leave us for a meeting at work. The original plan was to keep the haggis moving while half of the group were driven ahead for a lunch stop at Elsdon, then the other half would get a rest while the haggis was carried up the hill to Winter’s Gibbet. 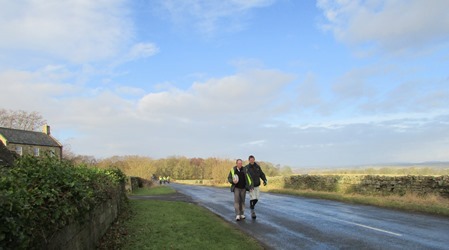 They were ahead of schedule however and everyone feeling good, so the walk carried on, thankfully leaving the last of the traffic behind (or what passes for traffic in Northumberland anyway) and onto the quiet back roads. In Elsdon we got to meet the wonderful Katie and Stephen at the Bird in Bush pub. Despite being in the middle of renovations and being out of the tourist season, they opened the pub and laid on a superb spread of hot soup & rolls so the lads could warm up with a well-deserved pint, and rest those weary legs for twenty minutes. Katie and Stephen had been through the experience of losing somebody to Motor Neurone Disease so it was particularly appropriate to take a break there in the lovely village of Elsdon. Rested and refreshed, the boys were ready to take on the climb out of Elsdon to Winter’s Gibbet. On the Tour of Britain bike race, this was the toughest climb of the whole route, and having walked it myself on fresher and younger legs many years ago I knew what they had ahead of them. It is a monster hill at the best of times, but having already walked so far across hills and moors it was a tough challenge, but up they went. Thankfully after that it was gentle going, just another six miles or so along reasonably flat roads to Wallington. Micky’s legs however had decided that they had seen enough, too much had been asked of them today. Weighing in at twenty stone, and built like a prop used to be built, Micky is not designed for long distance travel. To be honest, Micky isn’t even designed for short distance travel, as we see many weekends when he takes to the pitch as the Wallsend Water Engineer. He wasn’t going to give up however, so Grimesy and Garath Archer held back to stay with Micky while the rest powered ahead to the finish. In the far distance, the lights of Newcastle, still thirty miles to the south, sparkled on the horizon. From here they still looked a long way away. I wish I had kept some footage of this from the camera built in to the truck, as it was an unbelievably brave effort through what must have been intense pain from legs and feet. Later described by Grimesy as a twenty stone penguin, this was my view for the next two and a half hours. Micky’s legs in the headlights, as by now it was pitch black, making step after painful step towards the finish line. Part of me wished he would end his suffering and get into the truck, but I also admired his determination to finish without help. 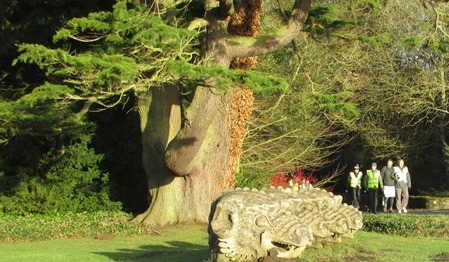 I can’t remember what the time was when we finally made it to Wallington. Everyone else was long gone, there was no sense of ceremony, just Micky trying to find out where his lift was, his phone flat and with no service, everyone too tired to think. I dropped Micky at my house to arrange his lift from somewhere warm while I ferried Grimesy and Arch back up the road to the Redesdale Arms which was where they were all staying. I had used a whole tank of diesel which didn’t seem possible, but I had been driving constantly for fifteen hours or more, so perhaps not surprising. The nearest petrol station was Morpeth, so by the time I got home it was 9.30. I picked up some of Doug’s pies from the back seat and a couple of rowies, stuck them in the oven to warm up, dinner sorted. Thursday morning, 25th January 2018, two hundred and sixty nine years since the birth of Robert Burns. It was bright but frosty, looking good for the day ahead. I dropped Junior at school then motored up the A68 to the Redesdale Arms where the troops were ready for the off. Last night had been Peely’s birthday, so they celebrated with steak & chips and a few pints, except they only had one pint, and some of them couldn’t even face that. Marius couldn’t face even steak and chips, so it was early to bed for rest and recuperation. We got the cars loaded up, said goodbye to Pete Massey who had a meeting in two hours at Barnard Castle (good luck with that Peter)and we set off once more for Wallington. What a difference from yesterday. After some photographs for the National Trust, all helping towards that much-needed publicity, they set off in sunshine, about as perfect a morning as you could wish for during winter in Northumberland. Without any sign of tired legs or sore feet, they walked briskly past the beautiful old house, through the gardens, then back onto the network of narrow and quiet roads that thread their ways through the rolling Northumberland countryside. Thankfully, the only hill that would be even slightly challenging came early, rising from the mighty River Wansbeck (not much more than a stream here) to Middleton Bank Top, with views across the Simonside Hills to the Cheviots, down to Druridge Bay and the North Sea. An aeroplane taking off from Newcastle Airport could be seen over the trees, so the end was almost in sight. We stopped for Jim Naylor to make a tyre change, and while he laced up his fresh trainers, one of the local farmers came out of his house bearing a ten pound note. He had heard of the hike and guessed who this motley crew must be, and he held onto the haggis ball while the boys got bottles of water and chocolate bars on board. The boys were motoring along now. Next stop Belsay where the BBC Look North crew were waiting to film them toddling along the road, then they were filmed mucking about with the haggis ball in the village while I cleared the shop out of bottles of water. News must have got around as a van driver stopped to put a donation in the tin, the lady from the shop then twigged why somebody had bought so many water bottles and she popped across with a big note, as did a passing motorist, which in the small ways of Northumberland turned out to be a neighbour from when we lived in Hebron. She had lost a good friend to Motor Neurone disease too. It seems more common than you might think when people start talking about it, which is why Doddie is so keen for people to talk about it. 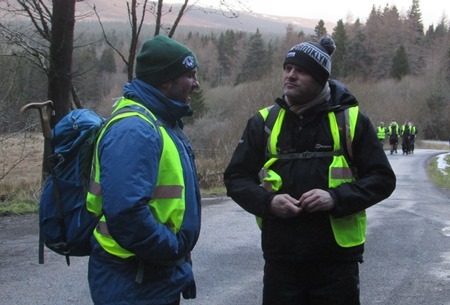 Raising awareness is a vital part of Doddie’s vision, and all the publicity from this Haggis Hike, the camera crews, radio and newspaper interviews all help, so that when people think about doing some good, they might think about MND instead of automatically giving to the better known charities, or not giving at all. Social media certainly comes into its own for something like this, and I finally discovered the point of Twitter. As a means of keeping people in touch with the progress of the hike, spreading the word, and raising awareness it is superb. Facebook, Snap Chat, Instagram and all these other entities have been invaluable, and the way that they spread the word instantly to such a wide audience is fantastic. Half a mile of busy road later and they were back on the quiet back roads, through Ogle and then heading to Kirkley. 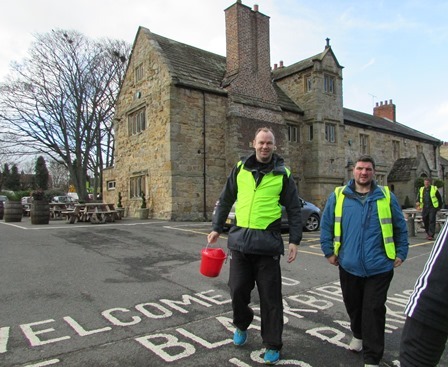 At the entrance to Kirkley Hall, Doug set up his mobile kitchen, and the lads grabbed pies and drinks on the hoof. My lunch was two pies, which meant I had eaten eight pies in two days, so much for the post-Christmas diet. Grimesy was on a mission so no stopping. He was determined to make KP in good time. 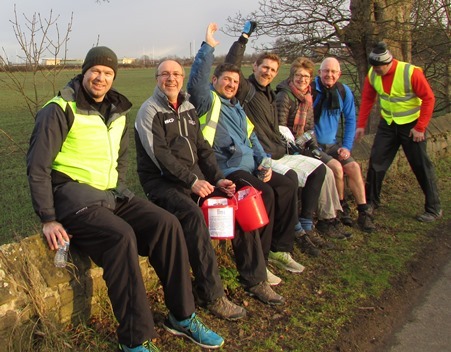 Some running repairs were required to blistered feet, then on into Ponteland. Grimesy’s determination to keep the haggis moving then hit a snag, a snag called The Blackbird. The prospect of stopping for a pint was just too much, so they all piled in, all except for poor Michael Stephenson that is. He was struggling, feet shot to pieces and consequently legs protesting too as he tried bravely to walk without pressing on his blisters. Not wanting to hold the others back, he kept on going at his own pace. 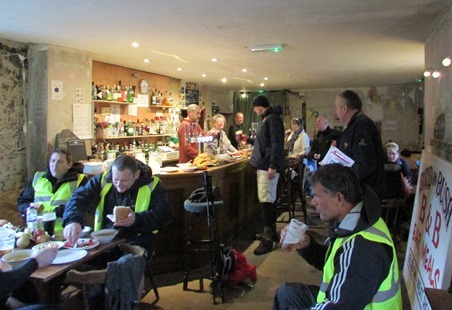 Meanwhile in the pub, pints all round and the buckets plied with donations, we met the new Chaplain to Newcastle Falcons, Paul Murton (apologies if not spelled correctly) a lovely bloke who would join them for the last leg, along with a couple of supporters who found them in the pub. The rest of the troops caught up with him at the airport and from now on they would all stick together. 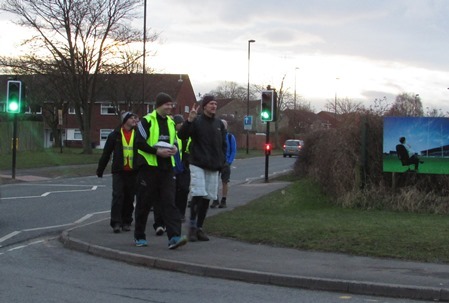 Away from the noise of traffic again they sauntered down the road to Kingston Park, past Druids Park and heading towards Bullocksteads. Suddenly it was there, visible for the first time and not far away at all; the glorious sight that is Kingston Park. This was celebrated with bottles of water and a sit on the wall. Nearly there. They were now close, so I motored down to KP to warn the inmates that the troops would be there in about ten minutes. I went to the entrance to get some pictures of them walking victoriously into Kingston Park, and was joined by two photographers who also wanted to record this momentous event. We waited, and waited, and I thought to myself, they’ve gone in the bloody pub haven’t they! So much for Lord Grimes ordering his minions to keep going. My phone rang, it was my wife, saying she had seen on Twitter that they were in the Twin Farms. Having seen what they had been through to get this far, I wasn’t going to begrudge them a pint. As the light began to fade, and any chance of getting a decent photo on my little camera faded with it, I was quite happy to wait. Eventually I recognised the mobile kitchen driving towards us, a sure sign that they were on the move, and moments later the high-viz waistcoats came into view. They had made it. It was smiles all round as they posed for photographs. The haggis had arrived safely at Kingston Park, all the way on foot from Scotland, job done. Time was now cracking on, and everyone had to go their separate ways to get ready for the grand event which would kick off about two hours later. While I hammered the truck homewards to get into best Northumbrian kilt and vintage Falcons shirt, various other people on the Supporters Club were at work getting the room finished off and ready for the guests to arrive. I should mention here, that while I got the glory job of accompanying the hikers and looking busy, behind the scenes a whole lot of other work had been quietly done by Lynne, Emma and Izzy. I was busy doing my own stuff, so I just got snippets of news about the progress that they were making, but it is obvious to anyone that making something like this come together for four hundred people involves a lot of work. The administration of putting the guest list together, keeping track of who had paid and how, and the myriad other things from raffle prizes to table decorations, involved many hours of work, and it is work that goes on long after the event. Just accounting for all the money correctly, and being a charitable event it has to be done very properly, is a big task. Between them they have made an enormous effort to keep it all on track, and it simply wouldn’t have happened without them. The evening went like a dream, despite worries just hours before that loose ends remained unsorted. The hikers were piped in to a massive standing ovation, and the haggis duly presented to Doddie. We were treated to messages of best wishes from afar from the likes of Nick Popplewell and Ross Nesdale. Gregor Fisher himself, yes that name will ring a bell, the original Rab C Nesbitt and a fine actor, sang a Burns song via the wizardry of video. The whole shebang exquisitely orchestrated by our Master of Ceremonies for the evening, George Embleton. A Burns poetry reading competition saw contributions from Matt Burke, Jason Leonard, and Billy Vunipola on video, Micky Ward, Joe Shaw, and Marius McHurter on stage. This was rightly won by Marius, not because of the quality of his reading, which sounded like stones stuck in a lawnmower, but because he just deserved it for travelling seven thousand miles to a freezing Northumberland in winter (and those who know Marius know that he doesn’t do winter, not at all), then walking fifty miles. The bloke is a bloody hero by any standards, so he rightly won the poetry competition. One contribution to the evening managed to silence the whole room. Those who are not familiar with the traditions of a Burns Night may not know about addressing the haggis. This involves reciting a very long poem, in language that is best described as the Scottish equivalent of Shakespeare, but much more obscure. It has to be done with drama and passion, it is in effect a one-man play. This was delivered by Doddie’s twelve year old nephew, Callum Weir, and was nothing less than outstanding. In all of the many Burns evenings that I have attended, I have never heard the Address delivered so well, with such an intimate understanding of the poem, it was beautifully done. If he so chooses, the wee man has a future as a very talented actor. The Kingston Park kitchen was on top form, delivering all three courses to the tables in fine form and amazingly quickly, even finishing off with gloriously disgusting deep fried Mars Bars. There was whisky on the tables including a very fine malt from the Glengoyne Distillery that should be added to anybody’s stable, which helped the evening along nicely. The true mark of a good evening is that it was all over too quickly. In what seemed like no time we were saying farewell to old friends and heading outside to find our taxis. It had been an amazing two days. If my days should end without ever attending another Burns Night I will not feel cheated, because I was at the best. No other Burns night could ever mean as much. So ladies and gentlemen, could you please charge your glasses with a dram, and raise them. To the Haggis Hikers and to Doddie. A great read, Monkey, and a tremendous effort from everyone involved. 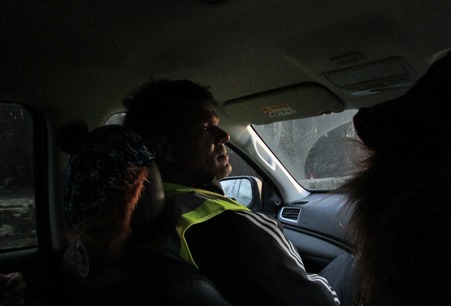 Great report Monkey, we just missed you in Belsay when coming back from a meeting in Gosforth. Well done everyone, can we know at some time how much money has been raised? ...can we know at some time how much money has been raised? Rough figures off memory are raffle £4,500, Haggis Hike on Justgiving around £10k, then there will be a goodly amount from the dinner tickets etc so I will be very surprised if the whole shebang raises less than £20k, £25k would be better. Considering that Grimesy's original target was £10k, that isn't bad going. Monkey thanks for telling the tale so well and getting across the unique warmth and determination of all involved. Sound like great pies too. He'l hate me for saying this, but I suspect Monkey of being a closet journo. Very nice piece. What a day for a fantastic man and a fantastic cause. The rugby family at its best. Tremendous effort...would have been great to participate in....and an excellent account. Thanks from a Gloucester fan and as you say at the start a member of the rugby family....Best wishes and good luck to all concerned. What an amazing report. Well done to all! Great read Monkey, thank you, well done to you and everyone else involved. The rugby family at its best.